More features? More fun? You bet. 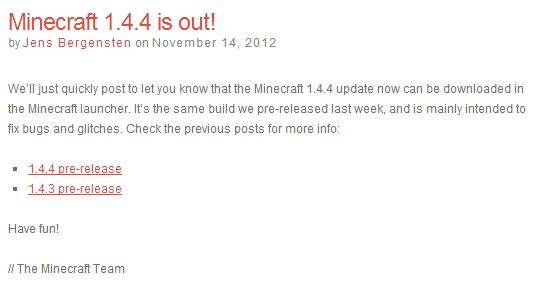 The latest version of Minecraft was released today, and fans can rest assured that Herobrine was removed again. Somehow he keeps sneaking back in there. Below is an abbreviated list of changes derived from the excellent coverage over at the Minecraft Forums, as well as the version history of the Minecraft Wiki for more. Item drops drop into transparent blocks and cannot be picked up. Crash when placing minecart on powered rail. This entry was posted in Art, Fun, Technology and tagged gaming, Minecraft, release, update, videogames. Bookmark the permalink.